Can the Mac's favourite virtualisation software win over Windows users? Parallels made a name for itself on the Mac, where it provided users a way of running Windows applications. This legacy is apparent in Workstation 2.2, with its stylish button bar and focus on improving the graphical interface of the client OS. Parallels Workstation isn't a particularly fast implementation though, both in normal operations and when installing operating systems. It was notably slow in an X.264 benchmark, and at installing Windows 2000 and Ubuntu 9.04. What's more, even after the lengthy install the app quickly crashed, and it wouldn't install Ubuntu 8.02. 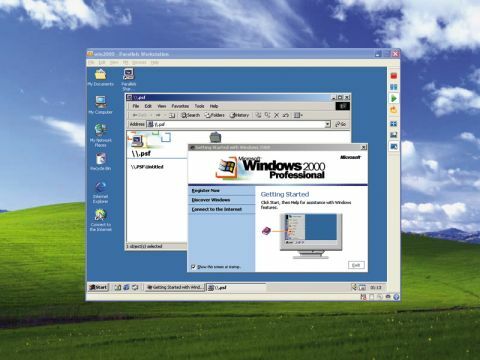 Windows 2000 worked well, however, and boasted the fastest boot and resume times of any of the platforms. There are a few peculiarities with the interface – for instance, that you can only see one virtual machine at once. It's also a little cluttered as well, and the dropdown menus haven't been fully thought out. You do get USB support, though, which makes up for a few misgivings.